It is very easy to come to Crete and explore it. Crete offers excellent air connections with the rest of the world and it is also possible to reach Crete by ship. Travelling within Crete is also easy. There are bus routes that cover the whole island and Matala of course, while the car is even more convenient, thanks to the existing road network, which allows the visitor to reach every place easily and fast. Matala is 71 km south of Heraklion, located in a very pretty and picturesque spot in the Bay of Messara. The road to Matala is extremely good, with a tarmac surface and decent signposting. You are, after all, heading to one of the major tourist resorts of Crete. 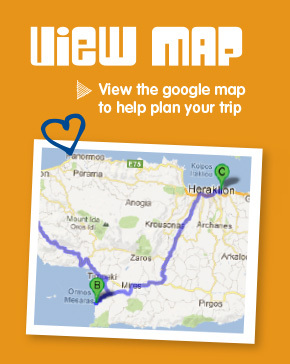 Motorway to "Iraklion (Heraklion) - Rethimnon - Chania". After 10 km turn right to "Mires - Phaestos (Festos)-Timbaki". In a round you now under ride the motorway and turn right to freeway 97 to "Mires - Timbaki". Aegean Airlines, Olympic Air, Cyprus Airways, Sky Express, JetairFly, TUIfly, Τransavia, Condor, Easyjet, Ryanair, Air Berlin and many more! From market square and 1866 square for all districts of the city and surrounding areas, Akrotiri, Souda (port), beaches etc.